The Cincinnati Reds (5-9) have won four of their last five games and will start the first of seven games in California tonight. Before playing against the first place Padres this weekend, they’ll start a three game series against the Los Angeles Dodgers (9-8) at 10:10 PM. The Dodgers started the season 8-2, but they have lost six of seven since (all coming against the Cardinals and Brewers). Yasiel Puig will make his anticipated return to Dodgers Stadium this evening. He is one of five former Dodgers in the Reds lineup tonight, joining Matt Kemp, Jose Peraza, Scott Schebler and Kyle Farmer. 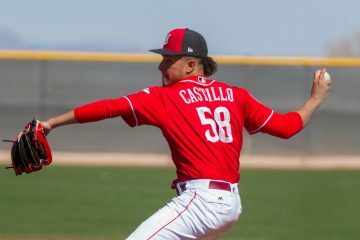 Luis Castillo is off to a tremendous start to 2019. His first three starts have gone about as good as you could ever hope for. He will have a big test tonight against the mighty Dodgers lineup and against Clayton Kershaw. The one small area of concern tonight is walks. Castillo has walked 8 batters in his first three starts. The Dodgers lead the MLB with 78 walks. They also lead the NL with a 137 wRC+ and 35 home runs. Castillo has a career 2.19 ERA in 2 starts against the Dodgers (12.1 IP, 1 BB, 17 K). He had a terrific start in Dodger Stadium last May: 6.0 IP, 4 H, 2 ER, 0 BB, 8 K.
Clayton Kershaw will be making his first start of 2019 for the Dodgers tonight. He missed the start of the season due to shoulder inflammation. He made two rehab starts (1 in AAA, 1 in AA): 10.1 IP, 9 H, 4 ER, 3 HR, 2 BB, 12 K. This is the first year in a long time for Kershaw that he comes into the year not in the conversation for the best pitcher in baseball. Kershaw’s 2019 projections are still very good, but down from his incredible run of dominance from 2011-2017. His fastball velocity was down from 93.1 MPH to 91.4 last year. That likely had a significant impact on why his K/9 dropped from 10.39 to 8.65. Kershaw has a career 2.54 ERA in 10 career starts against the Reds (22 BB, 78 K). However, the Reds haven’t faced Kershaw since 2016. From #Reds: Per Elias, Curt Casali is the first Reds catcher, since 1900, to start a game batting leadoff. This is the Reds first game of the season against a left-handed starter. A few hitters that mashed lefties last season were Eugenio Suarez (169 wRC+), Curt Casalli (164 wRC+) and Matt Kemp (124 wRC+). Joey Votto has his second off day of the season tonight. David Bell said that Votto would have more off days this season to keep him fresh. Votto is 5 for 25 with 2 HR, 4 BB and 13 K vs Kershaw. Cody Bellinger leads all of the MLB in fWAR (1.8) and leads the NL in wRC+ (258), HR (9), Runs (22), RBI (22), AVG (.424), OBP (.500) and SLG (.909). He isn’t the only Dodger tearing the cover off the baseball right now. Enrique Hernandez (4 HR, 171 wRC+), Joc Peterson (6 HR, 158 wRC+), Austin Barnes (131 wRC+) and Max Muncy (4 HR, 130 wRC+) are all off to big starts. The Reds will really need their left handed relievers to step up in this series. Alex Wood would have been really nice to get a start in this series. 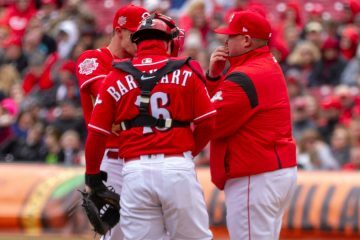 Reds relief pitcher leader in fWAR? The next 17 games for the Reds are really tough (3 at LAD, 4 at SD, 3 vs ATL, 3 at STL, 4 at NYM). 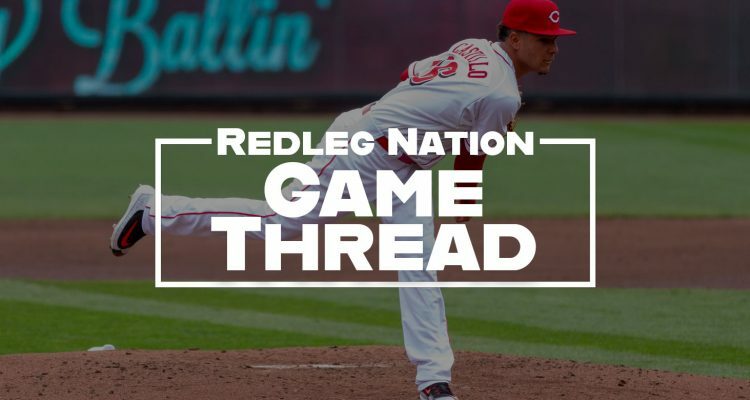 How the Reds do over this stretch could determine if they will really be competitive in 2019 or not. Go Reds! The reds will need baserunners to score runs . Jose Peraza has zero walks in 43 PA and Matt Kemp 0 BB in 38 BB. If Dusty Baker happens to see this lineup he’s going to be questioning his own sanity. If the Reds go 11-6 during this stretch it would give the Reds only a 16 win and 15 loss record the first week of May. Now if the Reds sign 2 certain free agent pitchers (Craig Kimbrel and Dallas Keuchel) before the first week of May, I will be buying play-off tickets. The two (who are still inflexible with there demands) would still need a near month to get to speed. Any word on how Deitrich is? Dang, the Brew Crew are at it again. They knocked Hudson out after 3.2 IP with the Brewers coming up in the bottom of the 5th, leading the dirty birds 6-3. Yelich with a 3 run HR & a solo dinger by Mous. Alex Wood scheduled to pitch off the mound on Saturday for the 1st time since spring training. Fingers crossed Reds fans. He’s still a ways off from pitching live games, but Wood’s addition to the MLB rotation could be a huge boost to an already good starting rotation. That is an interesting line up, that’s for sure. Looks almost like Bell wants to get all the ex Dodgers in game one. I’ve never understood the lack of love for Jose Petaza. But what has me baffled now is the willingness to give him up because we have two guys on minor league contract who are filling innicely for an aging injury prone second baseman. Except scooter is not injury prone. He has an injury that is true. Injury prone is playing a season worth or less of games in 2 seasons…. sort of like…..senzel. Deitrich shouldn’t be on a MiLB deal, how we got him on one was a shock, and Jose I isn’t a bad pick up either. The problem with Peraza is that he has had near 4 seasons to figure it out. Still having trouble. He is due arbitration next year, still has trade value now. we have backups, and the money argument is not valid. Yes and no on Peraza: yeah, he should be a little farther along, but I still blame some of that on his initial use when he became a Red. That put him back significantly IMO. He is still young and I really believe this may be the season he puts it together. Usually I’m in the “deal ’em” camp when they have peak value, but he is one guy I’m holding on to. I like the utility. He put it together last season. He put up 2.7 WAR, more than Jose Iglesias. It’s like last year didn’t happen with some fans. That Peraza at bat is why he needs to be just not. A grossly out of the zone pitch and nearly hit into a double play. Garbage. even his hits look that gross. AND as i am typing this he TOOLBANs. GARBAGE!!!! Casali said he wants to create havoc. Made him throw 8 pitches. Back to Scooter. He played most of the season her last year, and he’s out for at least a quarter of the season this year already. I don’t know where you got your definition of “injury prone“. Regardless of your opinion of what kind of contracts they should have signed, they are two very able players who came in on minor league contracts. And they are filling in for an injured second baseman who is injured all last year. So your solution is to dump Jose Peraza. Let’s have this conversation in six weeks. Maybe Scooter. will be back on the field. Maybe not. Right now he’s not out producing Ron Oester. Pitchers hitting folks. How exciting. Do they still fine players? Can they? Will the front office and let him be fined? If you don’t fine Castillo you can’t fine anyone. Not his fault on that at bat but man, Bellinger stands extremely close to the plate. That said, ouch! Can’t believe they are keeping him in the game though. Yelich 3 HRs tonight. 7 RBIs. Thank you, you notice how he didnt homer in cincinnati? No, we are playing the dodgers not the brewers right now. Are you getting paid by the reply? Besides, I thought the narrative here at RLN was that the Reds were going to contend this season. I have a few other games on at the same time. As Sliotar repeatedly points out, he watches a lot of baseball. ESPN tearing apart Puig. “Sucked the oxygen out of the room. Tore up outfield position cards in front of coaches. Let Puig play. Dodgers don’t need to attack Puig through the media. We can’t afford to give away so many outs. You might be able to make an excuse for Castillo, but that was an incredibly boneheaded play by Peraza. Both these guys have settled in. Time for Peraza to work his way out of a slump on the wrong end of a platoon with DD. His RLN supporters have dried up this year? Brand new game. How’s the BP looking? Castillo not sharp but competed his tail off against Kershaw. Gave his team a chance to win. Castillo battled thru 5, just off with his command a little tonight. I’m glad they didn’t bring Lorenzen in, with the bases juiced. Jim Day sounded incredulous when Welsh informed him the Dodgers are paying $20M this year for analytics. Peralta with the nice comeback. Time to put up a few runs. Yeah, Duke and Garrett have pitched each of the last 2 days. Get a run, let Iglesias deal with Pederson and Seager next time around to close it out. I haven’t been on Bell at all, but why in the hell would they bat Peraza 5th? Who are you, and what have you done with Robert Stephenson ??? Do I dare start to believe in this guy??? The reds aren’t winning this year. I think Angel just gave Jansen a gift there on strike 3 to Suarez. Kemp doing his best Vlady Guerrero…bad ball hitting impression. Golden chance to squeeze out a win now, especially since they had not scored outside of the Puig HR. Geez, that third pitch to Winker was a strike? Seriously? Thanks Iglesias. You earned that loss. Bullpen woes extend to Iglesias. He wasn’t right that entire outing, from pitch 1. Iglesias and Votto aren’t what they were . Iglesias has looked suspect the early parts of the season, whereas Garrett and Stephenson have looked exceptional thus far. Gotta wonder if these guys get save chances if Iglesias continues like this. you know , I wouldn’t be surprised if our win total this year is the same as it has been the past few years, albeit with much more competitive games then years past. For this team to get over the hump though, the culture has got to change. the Castillo ground out to the right fielder is a classic example. He is laughing about, the dugout is laughing about it like it is no big deal. I mean I go to a lot of minor league games at all levels and I don’t see the lack of concentration that I see every game with the reds team so that means there are still some bad apples in the clubhouse.